Treat your friends and family to a holiday party that only looks like you spared no expense! 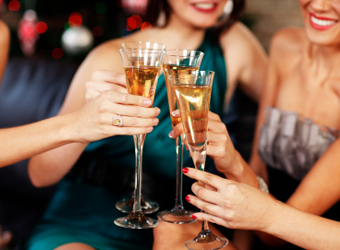 Mindy Kobrin, party planning guru and creator of MealsonHeelsbyMindy.com, shares her money-saving tricks. Single out a signature drink. Instead of racing to the liquor store to stock your entire cabinet, save money by choosing one special but not-too-expensive drink. You’ll only need to buy the booze you need for it, and having a signature drink gives your party an instant theme—très chic! For a casual vibe, Kobrin suggests whipping up a pitcher of Dirty Martinis (see recipe, below). Want something more festive? Kobrin suggests La Vie En Rose Champagne Cocktail (see recipe, below). While you could run to Crate & Barrel for thematic knick knacks, Kobrin recommends utilizing items you already have in your house. For a cute, on-the-cheap idea, fill clear vases and other vessels in different shapes and sizes with water, then add a couple of drops of food coloring, depending on the color scheme of the party (for Christmas, go with red and green). Place them on the fireplace mantel , foyer table, near candles where the light shines through—they’ll add ambiance and fun to any party. Or use old jam jars as votives and bud vases; drop a candle in or some flowers from the grocery store florist. In the winter, there’s a gravitation toward comfort foods, so don’t be afraid to turn simple, inexpensive soups and stews into cocktail fare, says Kobrin (see Kobrin’s recipe for Potato Leek Soup, below). Pour a little into espresso cups or small tea cups and you have an instant, unexpected hors d’oeuvre. Put a platter of small bites of crusty bread on the table, and you’re done. Get personal with party favors. Instead of shopping for small (costly) gifts at the store, look in your kitchen: “Homemade baked goods are always appreciated and adored,” says Kobrin. So the night before, whip up something quick (Kobrin’s standby is her Old Fashion Peanut Butter Cups; see recipe, below.) Wrap the goodies in tissue paper. Then make little recipe cards, punch a hold in the corners, and secure one to each package with a ribbon. Your guests will still be talking about what a great time they had when they nibble on the sweets the next day! Pour ¼ cup of vodka into each of the chilled Martini glasses. Add one stuffed olive to each plus 1 tablespoon olive juice to each glass. Garnish each glass with a lemon twist. Serve chilled. Soak the sugar cube in the rose water until dissolved. Pour rose water into a chilled Champagne flute then top with rose Champagne. Garnish with fresh rose petals. Construct bouquet garni inside cheesecloth. Close and tie with kitchen twine. Set aside. In a large Dutch oven on medium heat, melt the butter and warm olive oil. Add leeks, minced shallots and garlic; cook until very soft approximately 10 minutes occasionally stirring. Do not brown. Add cubed potatoes, chicken stock and bouquet garni. Bring to a boil before reducing heat to gentle simmer. Cook until potatoes are fork (very) tender, approximately 40 minutes. Discard bouquet garni. Working in batches, pass soup mixture through a food mill with a medium disk or purée in a blender leaving some texture. Warm soup over medium-low heat. Slowly stir in whole milk and cream then season with salt and fresh white pepper. Once milk is added, do not boil soup. Spoon into small cups and garnish with chervil leaves of chopped chives. Prepared in 15 minutes or less, plus overnight to refrigerate. In a small bowl, combine the confectioners' sugar, peanut butter, light brown sugar, butter and vanilla. Cover and set aside. Line a muffin tin with 2-inch foil muffin cups. Drop a rounded teaspoonful of peanut butter mixture into each cup then top each with 2 teaspoons of the melted chocolate mixture. Refrigerate overnight until set. Yields three dozen. Option: Sprinkle toasted sliced almonds atop the peanut butter cups for added texture and crunch. thanks for the ideas and recipes! Love the website! !